Image: DC Comics. Art by Mikel Janin and June Chung. 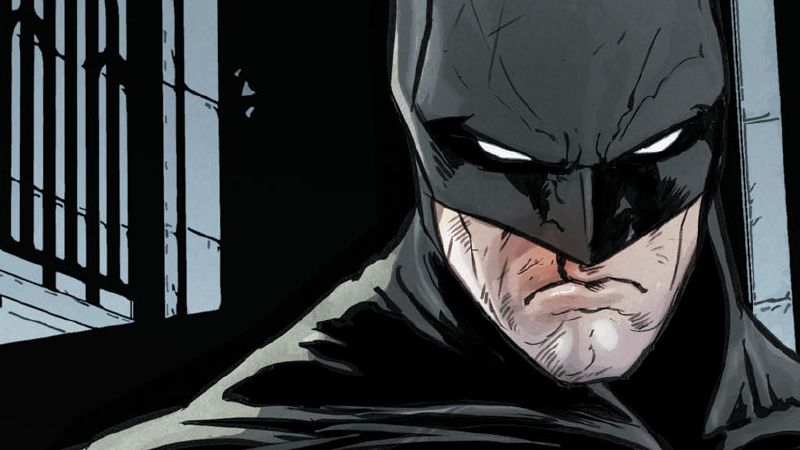 Batman #32 is much more than just Selina Kyle’s answer to Bruce Wayne’s marriage proposal. The story behind it reveals a pivotal moment in Bruce’s past, one that comes to define not just his role as Batman, but how Bruce sees himself as Gotham’s Dark Knight. The relationship established between Catwoman and Batman throughout Tom King run on Batman so far has been defined with the brutal honesty they have with each other—the “earned tragedies” of their respective lives, as Selina calls them in today’s issue, by King, Mikel Janin, June Chung, and Clayton Cowles. So it makes sense that that Selina’s final decision, to say yes to Bruce—this time a request, not a demand, she notes—comes from a moment where Bruce bares his soul to her once more, in a flashback to the climax of the past-set Riddler/Joker conflict that’s driven this latest arc. The moment specifically, is the end of the conflict, which sees Batman finally able to confront Riddler and Joker together, only to find Riddler furious at the Joker’s complete lack of a response to the games he’s been playing in their brutal war. It’s broken Riddler, who just wants to know how to get the Joker to finally laugh at one of his riddles—but in doing so, he reveals his role in the tragic story of how Charles Brown became the Kite-Man. And the first person to break isn’t the Joker, but Batman himself. Batman #32 Art by Mikel Janin and June Chung. The Joker/Riddler War has brought untold chaos to Gotham, something that’s been wearing on the Batman of the past—still decently early into his crimefighting career—hard. But hearing that the bloodshed and tragedy its left in its wake is for such a pointless endeavor, especially when it comes to Kite-Man’s son being nothing more than a tool for the Riddler to use in his war, is the final push for Bruce to do something that is the very antithesis of everything he’s gone on to stand for as Batman. He tries to kill the Riddler. Picking up a nearby knife, Bruce recalls to Selina that it wasn’t an accident, or he hadn’t lost focus. He lunged at the Riddler intentionally, of sound mind, under his own influence. And he absolutely meant for the lunge to kill him, breaking the cardinal rule that Batman has set for himself and his wards for years and years. But Batman didn’t kill the Riddler—in fact, he only didn’t because the Joker thrusts his hand out to stop him, taking the knife clean through it, and only then does he finally laugh, having saved his mortal enemy from, well, his other mortal enemy. Bruce thinks the joke the Joker finally laughs at, and part of all the grief he’s given himself over the years, is because it was a moment that would forever prove that being Batman was a lie—that, deep down and at his weakest, emotionally speaking, Bruce is no better than the villainy he fights against in Gotham. That the only line between what makes him different from them isn’t that he will never try to kill someone, but the fact that the Joker, of all people, stopped him from murdering the Riddler in a moment of indescribable rage. Bruce tells Selina all this because he thinks it means that he’s not worthy of her loving him—that he can love her, and accept her past, but his own past is unacceptable. But as we know now, it’s not something that bothers Selina. In fact, she pretty much doesn’t care, which is what leads to her finally saying yes to marrying Bruce. Marriage is undeniably a big event in the world of Batman, one that will take the character in some new directions. But really, it’s the revelation that Bruce has it in him to be just as lethal as his foes, when the right buttons are pushed, that will have a lasting impact on the character going forward.